Shure is a company that has a long history in the field of creating high quality headphones. Its Shure SE846 range is an in-ear variety. At this point, most audio purists will frown and stop reading the review. After all, in-ear earphones and audio quality don’t go hand in hand, right? This isn’t necessarily the case. Shure has several types of high quality in-ear models, Shure SE846 being one of those. The earphones have a number of excellent characteristics, as well as a few shortcomings. All in all, however, this is a wonderful piece that’s worth your consideration. The Shure SE846 has several features that are supposed to guarantee the quality of the audio. These earphones have quad hi-definition microdrivers, as well as customizable frequency response. They are characterized by impressive bass, which is quite uncommon among such earphones. Just like other Shure earphones, these ones are designed to be worn over the year. The earphone aperture is made of metal, which increases longevity and durability. The design is comfortable and the manner in which the tip fits in the ear delivers sound-isolating qualities. Removable filters: the earphones come with filters that can be used or removed on the basis of your music listening preferences. There are three different filters to choose among, which means that the earphones give you a degree of customization that isn’t available with other headphones. Many tips to choose among: the earphones come with foam tips but the set itself gives you several additional options. There are silicone and rubber tips, as well. These come in several sizes to ensure perfect fit. Accessories: the kit comes in a beautiful box but you’ll also get a carrying pouch. On top of having several different types of tips and the filters included in the package, you’ll also get a spare cable and a keychain that can be used for the convenient storage of the backup tips. Several colors: for some, this may be a minor consideration but Shure gives its clients access to two designs. The first variety is clear but SE846 could also come with a metallic bronze finish. As one of the top Shure earphone options, SE846 is a very expensive product. For most people, spending over 990 dollars on earphones isn’t going to make a lot of sense. This is the biggest disadvantage and the main problem that most buyers have with these earphones. SE535 delivers similar performance: many buyers found SE846 similar to the less expensive SE535, making people wonder whether the additional expenditure was justified. Unusual method of wearing the earphones: the fact that the cable has to be positioned around the ear made some users uncomfortable. Bulky: the earphones are a lot bulkier than other much more streamlined Shure models. Anyone that is looking for top quality and isn’t going to be scared by high audio equipment prices will find the earphones worth the purchase. 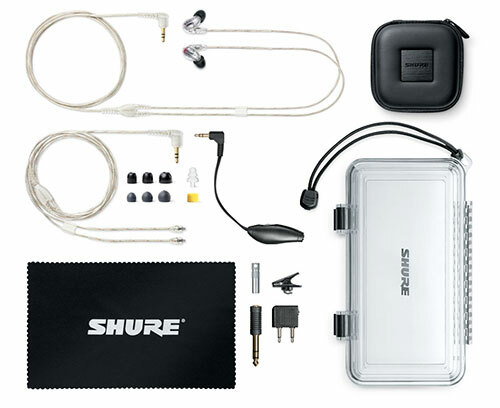 Shure SE846 audio quality is superb for in-ear earphones and this product is delivered with an amazing range of accessories. Still, Shure has several other models that do an excellent job and have a much better price to quality ratio.